Mulching your tree can do fantastic things for its health but it must be done properly. Mulches are materials placed over the soil’s surface to maintain moisture and improve soil conditions. Mulching is one of the most beneficial things a home owner can do for the health of a tree. Mulch can reduce water loss from the soil, minimize weed competition, and improve soil structure. Properly applied, mulch can give landscapes a handsome, well-groomed appearance. 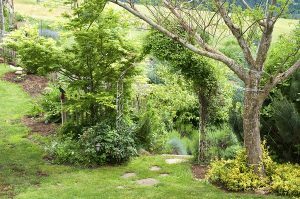 Mulch must be applied properly and if it is too deep or if the wrong material is used, it can actually cause significant harm to your tree and other landscape plants. Applying a 2- to 4-inch layer of organic mulch can mimic a more natural environment and improve plant health, especially in urban landscapes. The tree’s roots, which are essential for taking up water and minerals, require oxygen to survive. A thin layer of mulch, applied as broadly as practical, can improve the soil structure, oxygen levels, temperature, and moisture availability where these roots grow. As beneficial as mulch is, too much can be harmful. An abundance of mulch can lead to excess moisture in the root zone, which can stress the plant and cause root rot. As mentioned, the generally recommended mulching depth is 2 to 4 inches and should be adhered to in order to get the most natural growth from your trees. Mulch serves as a natural insulating blanket. Mulch keeps soils warmer in the winter and cooler in the summer. Mulching around trees helps facilitate maintenance and can reduce the likelihood of damage from grass cutting. Many types of mulch can improve soil aeration, structure, and drainage over time. Mulching helps control weeds. A 2- to 4-inch layer of mulch will reduce the germination and growth of weeds. Some mulches can improve soil fertility and can give planting beds a uniform, well-cared-for look. This entry was posted on Friday, September 8th, 2017 at 3:16 pm. Both comments and pings are currently closed.